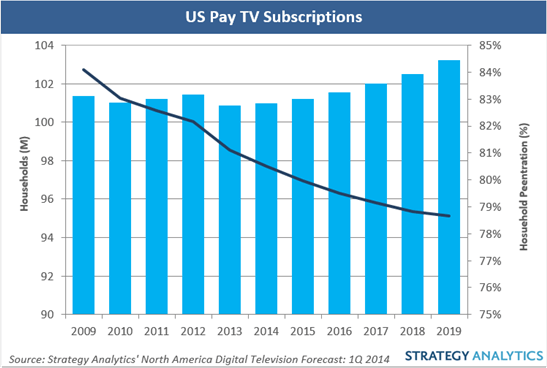 Recent research from Strategy Analytics forecasts a return to growth in 2014 for the US pay-TV industry at 0.14%. The findings are detailed in the Service Provider Strategies (SPS) service report, North America Digital Television Forecast: 1Q 2014. 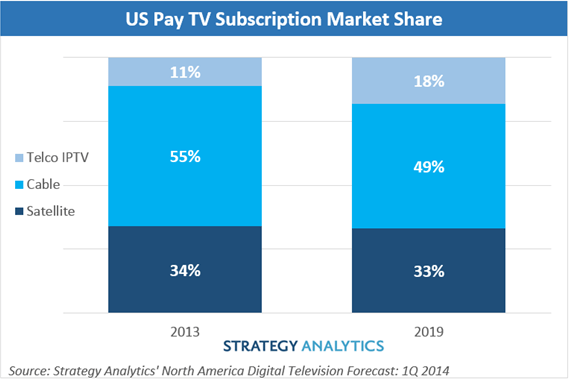 IPTV will be the bright spot of the pay-TV market in the US. In 2013, IPTV subscriptions grew by 17.5% year-on-year and this trend will continue with a Compound Annual Growth Rate (CAGR) of 8.3% through 2019. IPTV service operators AT&T and Verizon are approaching the future with different strategies, but both are focused on driving advanced services and multiplay bundles with digital television and high-speed Internet at the core of their packages. In the cable segment, Comcast has reversed a long-standing trend of subscriber losses, following the company’s rollout of its Xfinity X1 platform. Consolidation among US cable operators should enable faster digital transitions and a wider deployment of technology platforms. This trend will give customers better opportunities to access and consume content on multiple devices, when and where they want. “The digital transition has been a double-edged sword for the cable industry: Average revenues have risen, but higher prices have squeezed out some customers,” added Eric Smith, Analyst in the Digital Consumer Practice.